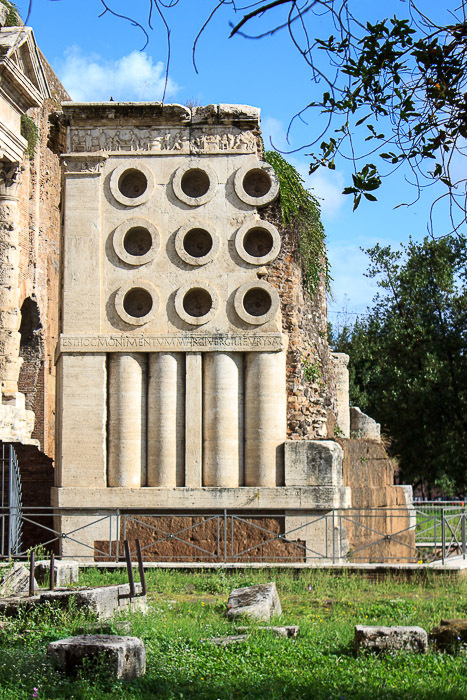 The Tomb of Eurysaces the Baker (3 photos below) is a large and intricate tomb built by the freedman Marcus Vergilius Eurysaces for himself and his wife Atistia between 50 and 20 BC. 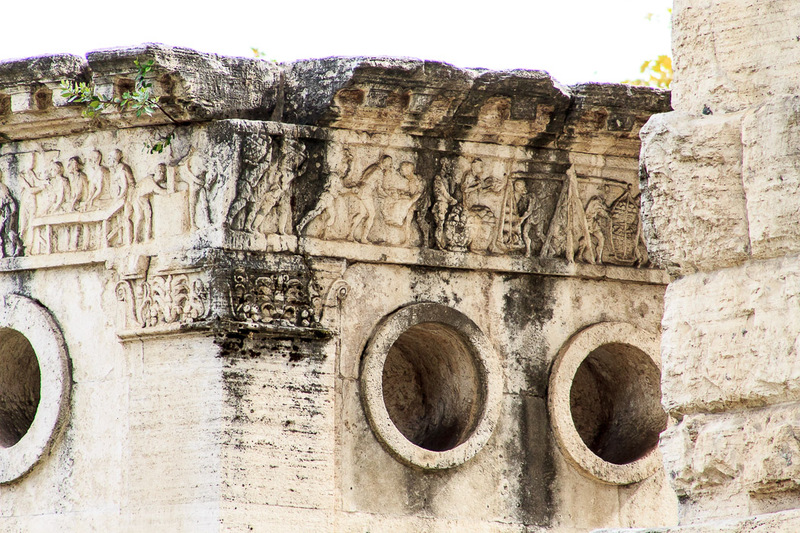 It is located in an extremely prominent position, just a few feet outside today's Porta Maggiore (3rd photo below). Eurysaces was a slave but was freed and became a baker. The inscription, visible in the band half way up the monument in the 1st and 2nd photos below, reads "EST HOC MONIMENTVM MARCEI VERGILEI EVRYSACIS PISTORIS REDEMPTORIS APPARET", which translates into "This is the monument of Marcus Vergilius Eurysaces, baker, contractor, public servant." Another monument by and for freedmen is the nearby Freedmen's Tombs, on Via Statilia. Burials were not permitted within the city; Eurysaces must have ended up rather wealthy to buy this burial spot and construct his tomb just feet outside the city boundary. 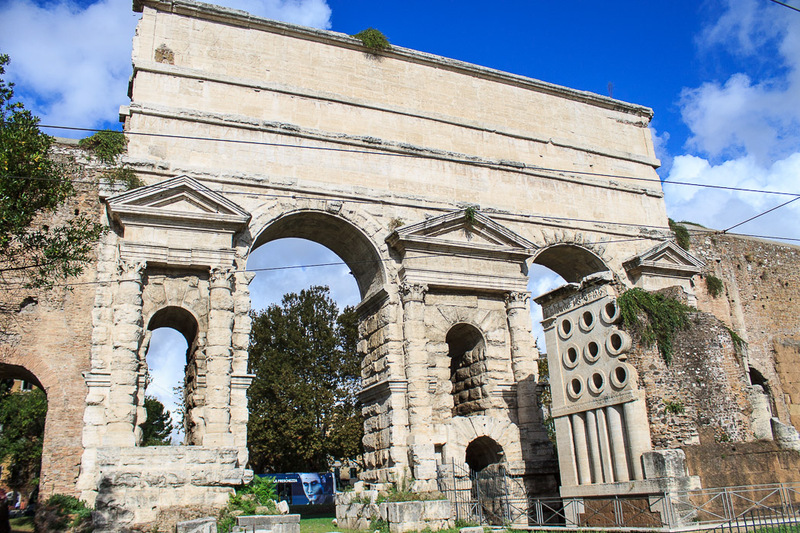 Since it was built before the Porta Pernestina (the ancient name of the Porta Maggiore), it must have been highly respected since the construction of the Porta Pernestina worked around it. See all Tomb of Eurysaces the Baker photos. 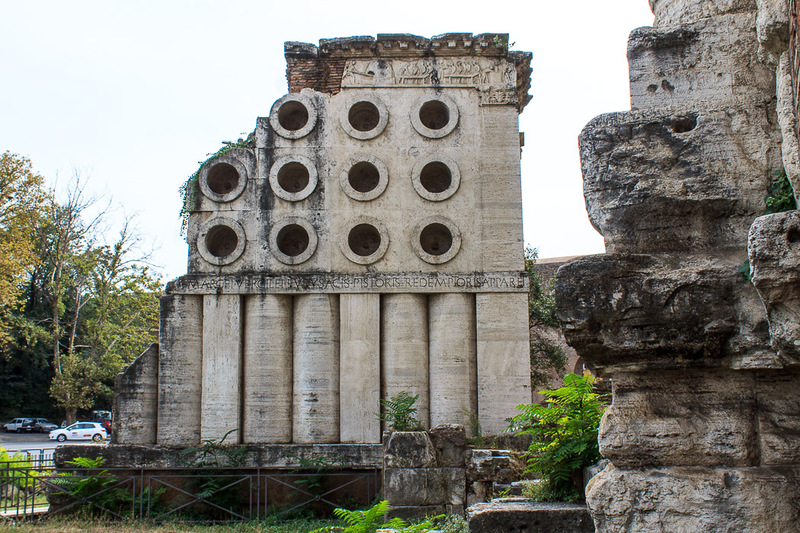 The tomb is 33 feet tall, made of concrete faced with travertine on a tufa base. 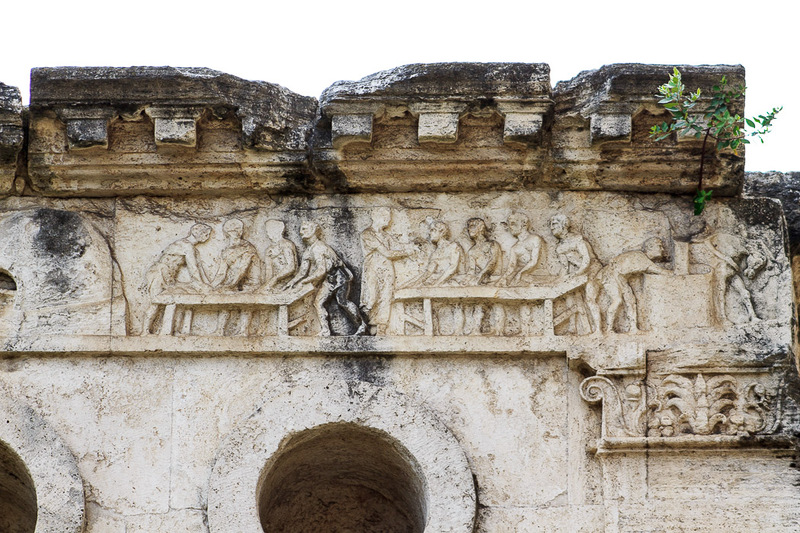 Along the top is a frieze (first 4 photos below) showing the processes of bread production in the bakery. The south side (1st photo below) depicts the delivery and grinding of grain and the sifting of flour. The north side (2nd photo below) depicts the mixing and kneading of dough, forming of round loaves, and baking in a domed oven like a pizza oven. The west side (right half of 3rd photo below, and 4th photo below) shows the stacking of loaves in baskets and their being taken for weighing. This illustrates an industrial-scale bakery, which accounts for the wealth Eurysaces was able to accumulate. 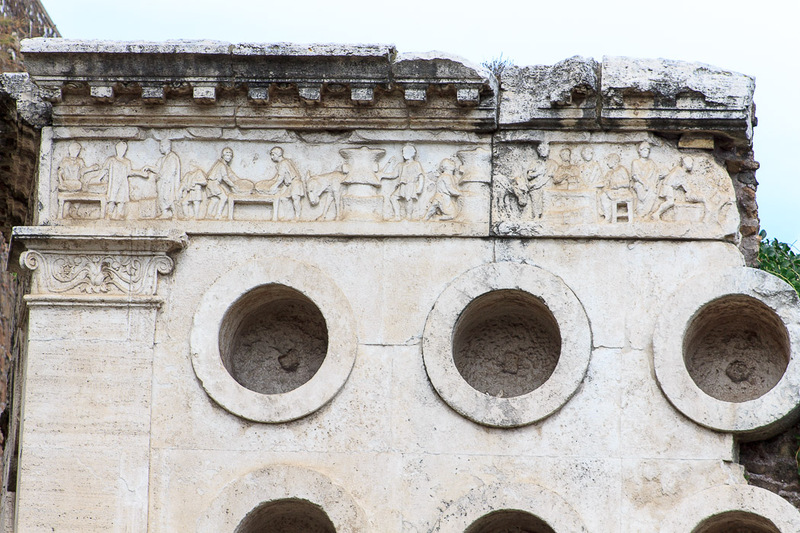 Below the frieze on the north, south and west sides (the east side is broken off) are cylindrical holes whose meaning is not fully understood (5th photo below). They might represent grain-measuring vessles, or they may be part of a kneading machine that employed metal attachments for the gears and arms that worked the machine. If so, it would demonstrate advanced technology used in the bakery. 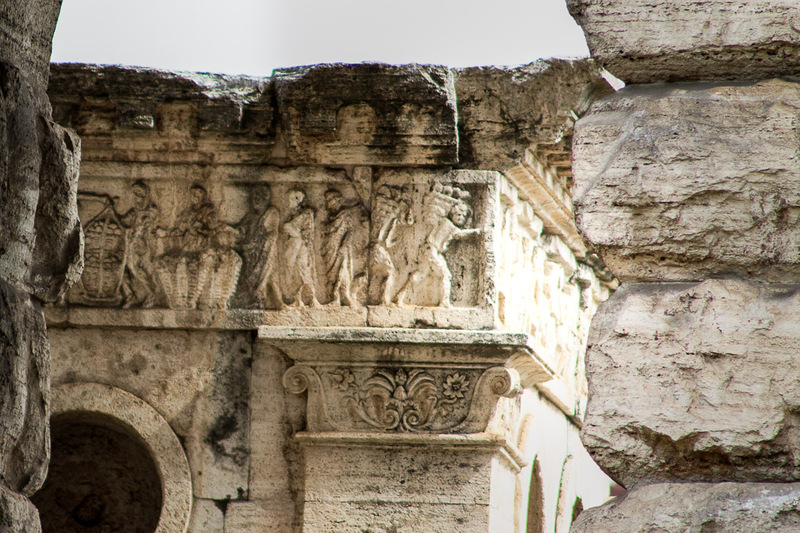 As Porta Pernestina became fortified in the Middle Ages, additions were built on top of the tomb. When they were removed by Pope Gregory XVI in 1838, a full-length relief portrait was discovered of a man and woman in toga and palla, and was taken to the Palazzo dei Conservatori of the Capitoline Museum along with an inscription honouring one Atistia, a good wife whose remains were placed in a breadbasket and an urn taking the form of such a breadbasket, but these relics are now lost. The female head was stolen from the relief in 1934; the urn might or might not be somewhere in the National Museum of Rome. What a shame. 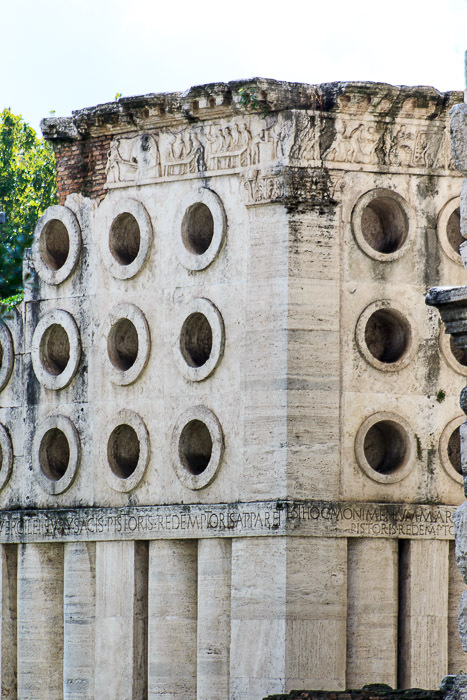 In any case, though, the tomb demonstrates that the "American Dream" of hard work paying off with wealth was in full flower during the late Roman Republic. A freed slave presumably created a small bakery, grew it into an industrial-scale business, and became wealthy enough and proud enough to build an intricate tomb in a prominent location to proclaim his profession to the world.